This week brings National Sugar Awareness Week and it could not have arrived at a more relevant time with parliament currently debating over a proposed sugar tax. Eating too much sugar can lead to tooth decay. Without treatment, tooth decay can progress past the enamel and into the deeper layers of the tooth, causing pain and possible tooth loss. To mark National Sugar Awareness Week Jacqui Kelly, a food artist, has created three sculptures entirely carved from sugar. The symbolic statues of a young girl, a teenage boy and a man have been created to represent the total amount of sugar from fizzy drinks that are consumed every minute among adults, teenagers and children in the UK. The statues stand up to 7ft high on the Albert Embankment revealing that children in the UK consume 44.5kg of sugar per minute from fizzy drinks alone, 158kg of sugar for teenagers and a staggering 385kg of sugar for adults. Almost two-thirds of adults in the UK are classed as overweight and the main contributor to a child’s sugar intake is fizzy drinks. Chef and campaigner Jamie Oliver has been urging the government to impose a sugar tax to help reduce the populations sugar intake. More recently, Oliver has also suggested to place an age restriction on energy drinks, in a similar way to tobacco, to help prevent young children drinking them excessively. Do you think this level of intervention is needed to help manage children’s sugar intake? 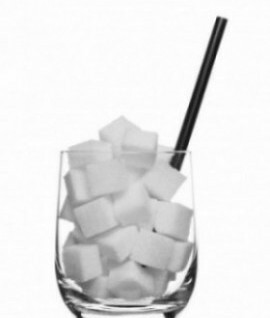 What do you think is the most effective way to make the population aware of the health risks associated with sugar? Whether it being something visual, like Jacqui Kelly created or enforcing laws – we’d love to hear your opinion.